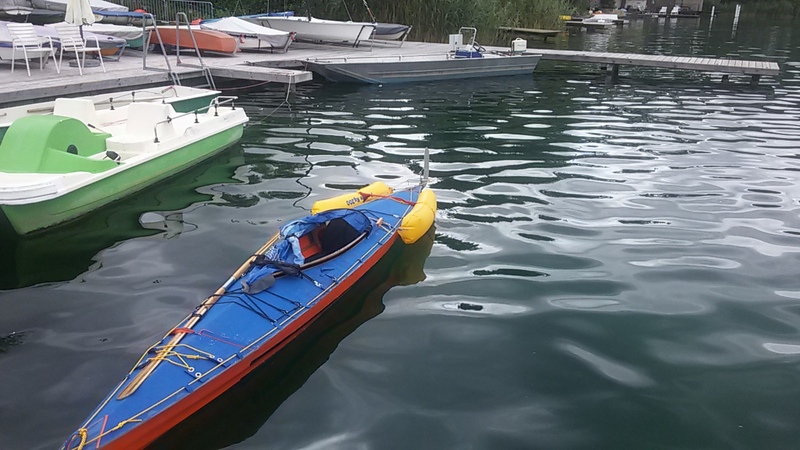 Folding Kayaks Forum • View topic - Re entry of Folding Kayaks after a swim . 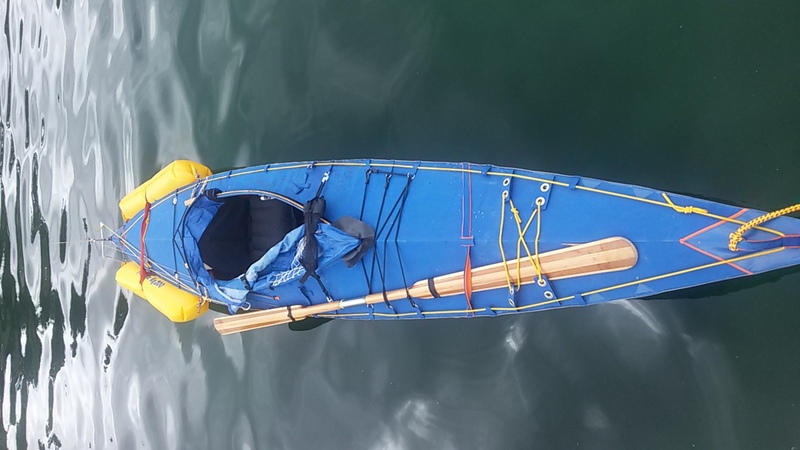 Post subject: Re entry of Folding Kayaks after a swim . DLee posed this question to klepperfreak (Mitch )in the introductions section of forum . Mitch uses his klepper for scuba diving . Possible some of you guys could post hints , links and techniques for re entry ,baling etc -maybe even a photo or a video to two on how to do it . 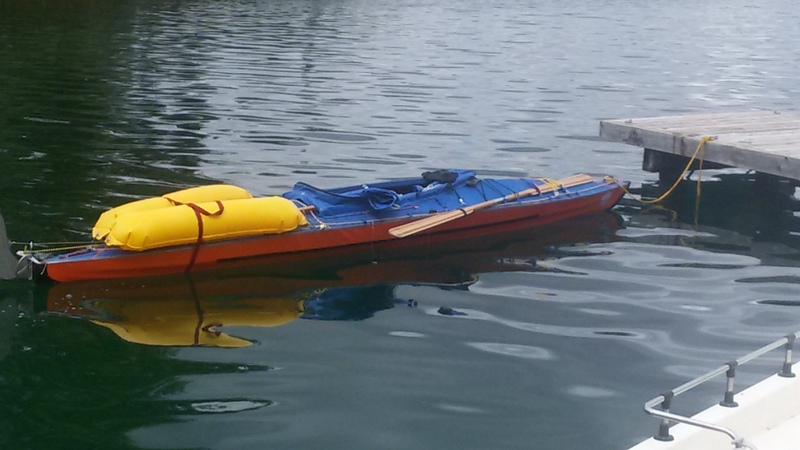 Post subject: Re: Re entry of Folding Kayaks after a swim . I've watched some videos on YouTube showing the Cowboy self rescue technique. It looks easy but it also looks like an easy way to lose your paddle if you're not careful. Since that post I've probably done close to thirty re-entries combined on both my single and double... mostly from sailing mishaps, but many from simply going swimming or snorkeling. I had a Long Haul Ute which was very difficult to re-enter and the Klepper T9 can be quite difficult as well when swamped. If I remember correctly, both of these (T9 swamped) required using the paddle float in one form or another to get back in. Otherwise the cowboy re-entry is by far the optimal choice for a beamy folder. The method I found easiest and most comfortable was to come along either side of the stern where the rear deck tapers down to the water - if you have the rudder installed. If there's no rudder you can start directly at the tip of the stern. Whichever spot seems more comfortable. The stern end without rudder is by far the easiest. Place your hands and arms up on the rear deck and start bouncing the boat. Build a rhythm and when the timing seems right give a good kick with your legs while pulling with your arms and you will be up on the back deck. Keep a low profile and skootch forward using your arms and legs. A sponson boat has a lot of stability with water in it. The sponsonless boats become very unstable and are equivalent to crawling up a log. I like to bail the sponson boat by sitting on the back deck just at the rear of the cockpit. Straddling the boat it's very stable and you can use a canvas bucket or hand pump with ease. I always keep my electric pump behind the seat in the cockpit because the access is easy from this back deck position. Once the pump is running the bucket goes into action and then the sponge when most of the water is gone. Once the boat is empty enough, simply crawl forward over the cockpit until you can lower your behind down into the boat. There's a couple ways to do this and practice will quickly tell you which is best for you. If the water is rough you can get back in the cockpit before bailing, this will keep things more stable. I have found that you can tie a paddle down across the coaming using the paddle tie downs. Put a paddle float on one end (or both if you have two) and you have a moderately stable outrigger system - there can be a fair bit of flex here so practice this technique. If the tie down straps don't reach the paddle can be tied down to the kayak frame members inside the cockpit. Just carry some extra line. In a sponsonless boat like the T9 I try and bail it out as much as possible before re-entering. This boat is near impossible to keep balanced when swamped... at least for me. A good and fun exercise is to lift yourself up out of the cockpit and sit on the back deck to get a sense of what the balance of the boat feels like in this position. Just be careful to keep your weight close to one of the support ribs so that you don't break the stern deck bar like I did on my T9. Ralph Diaz's book on Folding Kayaks has a great description with pictures on the cowboy rescue technique. The success of a comply reentry is very much dependent on the ratio of the paddler's height and weight to the boat's displacement At 6'2", my attempts to re-enter an Aerius I when I weighed about 200lbs were unsuccessful. A paddle float entry was not easy, but it was doable. i had problems to empty my t9 after capsizing. each bigger wave filled the boat again because the afterdeck was under water. the sponsons are fixed at the rigging and with the red sling I can fix them at the deck or near to the hull and bend the sponsons like a banana. did someone try a heelhook-paddelfloat reentry? with a soft coaming like pakboats (swift, saranac, ..., xt)? so you don't put any things on the reardeck? i decided to change the boat. yes I became old and stiff. question: reentry from which side - luv(windward) or lee?